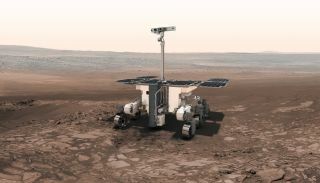 Artist’s illustration of the ExoMars rover, which is expected to launch in 2020. You can help name Europe's life-hunting Mars rover, if geography smiles upon you. The UK Space Agency has launched a public competition to name the U.K.-built ExoMars rover, which is scheduled to launch toward the Red Planet on a life-hunting mission in 2020. "The ExoMars rover is a vital part of this journey of exploration, and we are asking you to become part of this exciting mission and name the rover that will scout the Martian surface," Peake added. The contest is open only to residents of ESA member states and "associate members." So, you're eligible if you live in Austria, Belgium, Canada, the Czech Republic, Denmark, Estonia, Finland, France, Germany, Greece, Hungary, Ireland, Italy, Luxembourg, the Netherlands, Norway, Poland, Portugal, Romania, Slovenia, Spain, Sweden, Switzerland or the U.K. The competition runs through Oct. 10. The person who submits the winning moniker (which, hopefully, won't be Rovey McRoverface) gets a tour of the Airbus facility in Stevenage, England, where the ExoMars rover is being built. To learn more or to enter, go to the contest site. The life-hunting, drill-equipped rover is the second phase of the two-part ExoMars program, which is led by ESA with Russia as junior partner. Phase one consisted of a landing demonstrator called Schiaparelli and the Trace Gas Orbiter (TGO), which launched together in March 2016. Schiaparelli crashed on the Martian surface in October 2016, but TGO reached its desired orbit and recently began sniffing for methane and other potential signs of life in the Red Planet's atmosphere. NASA plans to launch its own Mars rover in 2020. The American space agency's Mars 2020 rover will, among other tasks, search for signs of ancient Red Planet life, cache promising samples for possible future return to Earth and test out an instrument that generates oxygen from atmospheric carbon dioxide.